“Thirty-six, thirty-seven, thirty-eight…” We were standing waist-deep in the fish pool at a restaurant on the shore of Lake La Vega. I (John) was holding a net and Professor José Luis Zavala, a biologist at Guadalajara’s Autonomous University, was doing the impossible: counting fish which had been extinct for years. John Pint (left) and José Luis Zavala counting "extinct" fish. The Goodeids or Splitfins are a family of some 40 species, all endemic to Mexico. They reproduce by internal fertilization and bear their young live. They happen to love algae, and will keep an aquarium free of it. On top of that, they are remarkably beautiful. 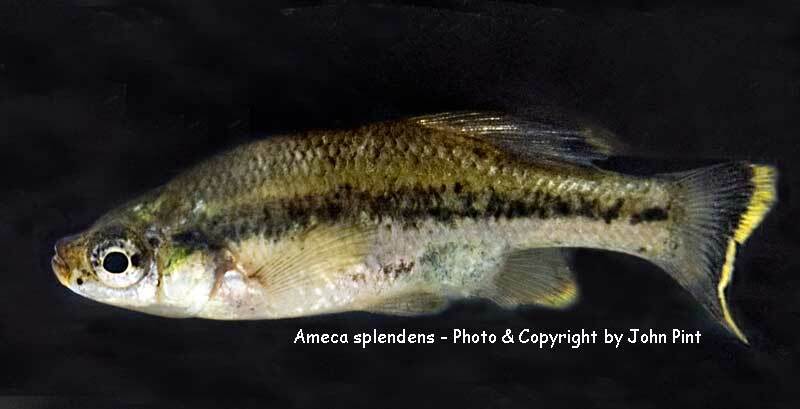 Ameca splendens and other Goodeids were discovered in the Rio Teuchitlán long ago and were soon being bred in captivity by fish fanciers around the world. 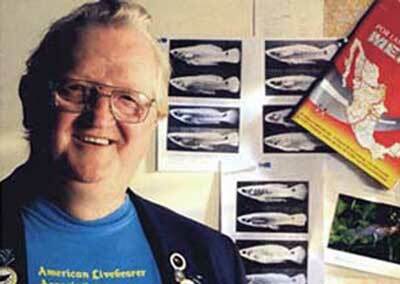 One of these was Ivan Dibble, an Englishman who has been specializing in livebearers since the 1960’s. At a convention in 1995, Dibble met Arcadio Valdes Gonzales, who brought him bad news from Mexico. Ameca splendens and several other Goodeids endemic to the area around Ameca had vanished and were now considered extinct. Verifying this was not difficult, as the Teuchitlán river bubbles out of the ground at a spring near the famed Guachimontones Pyramids and trickles into La Presa de la Vega only a few kilometers away. The fish had not been spotted anywhere along this trajectory and they couldn’t possibly survive in La Vega Lake because it has been polluted for decades by the government-owned Tala sugar refinery, even though dumping contaminants into the lake is against Mexican law. 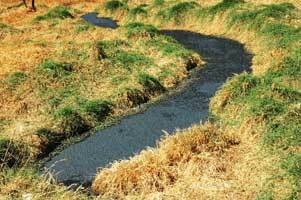 To make matters worse, the refinery people mix chemicals from sugar processing with ground-up cane stalks. 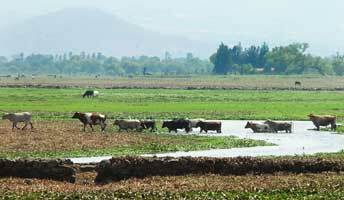 “They are putting nutrients into the dam which accelerates the growth of water hyacinths which in turn are suffocating the lake,” says naturalist Jesus Moreno. Black muck from the sugar refinery (Left) kills the fish while accelerating the growth of water hyacinths (Right). Although these delicate little fish cannot survive in La Vega Lake, some of them are still alive in pools at the restaurants along the lakeshore, because all of these are spring-fed. Unfortunately, the pools are not there for appreciating the fish, but for catching them, a favorite sport for countless little children on a typical weekend. In 1997, Dibble attended a symposium in Cuernavaca and discovered that the problem of vanishing native fish species was wide-spread all over Mexico. “I have almost always risen to a challenge,” says Dibble and he decided to take on the nearly impossible task of saving Mexico’s fish. After the symposium in Cuernavaca, Dibble was taken to an Aquatic Laboratory Facility in Morelia, run by the University of Michoacán. 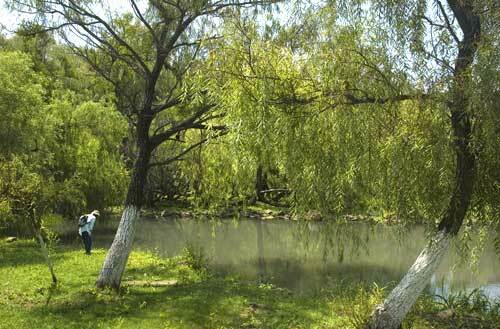 They offered to participate in a conservation project to preserve native Mexican fresh-water species. Dibble flew off to England, but returned to Mexico a few months later with two species of fish thought to be extinct in the wild, Skiffia francesae and Zoogoneticus tequila, both of which are now reproducing happily in Michoacán. 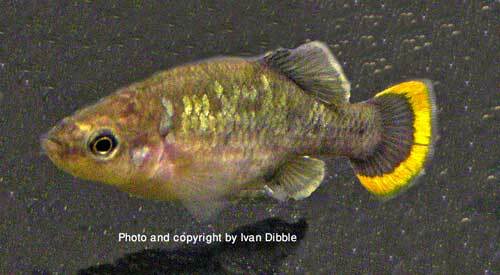 Ivan Dibble's most recent (and, indeed last) project involves the creation of a Goodeidae breeding pool along the Teuchitlan River. 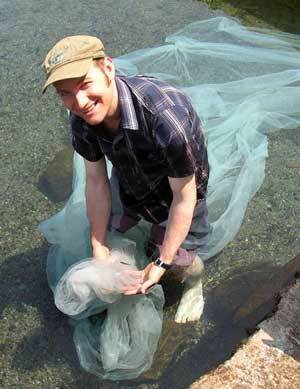 The help of local authorities and ichthyologists will be needed, as well as support from the general public. 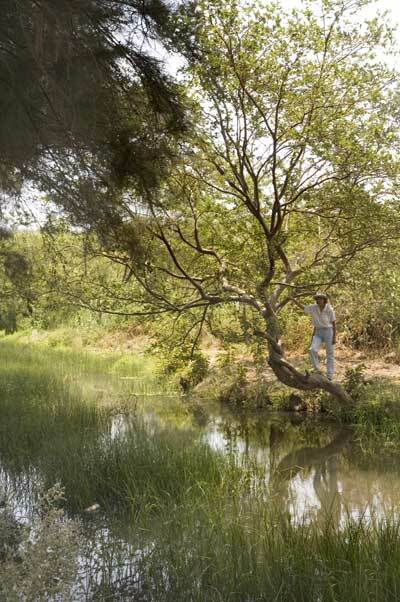 Susy Pint examines a possible site for the breeding pool on the banks of the Teuchitlan River, about 870 meters north of the highway to Teuchitlan. Ameca splendens is alive and well in this part of the river, but not farther downstream, which is polluted. 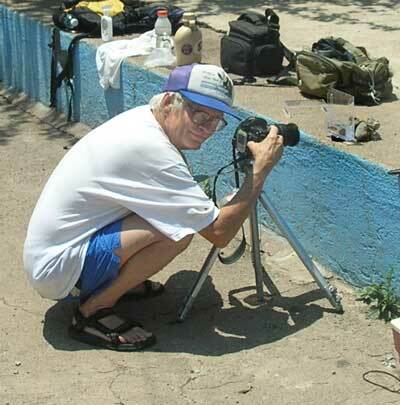 The mission of Ivan Dibble and friends is outlined at his Fish Ark Mexico page (http://home.clara.net/brachydibble/). Check it out and perhaps you too will decide to help the British save Mexico’s fish. Bridal veil used to catch Ameca splendens for the photo above. John photographing the little fish. 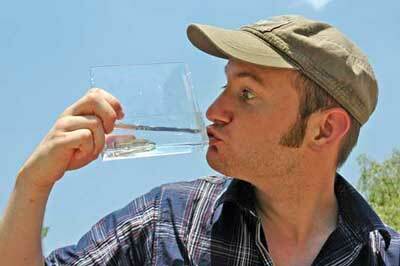 Matias of Switzerland kissing fish (note the size: this is an adult). Susy Pint alongside the lovely Teuchitlán River.